Blender (free) is pretty daunting to someone who's never used 3D modeling or animation software. For me, using Blender 2.60a was somewhat like having to know exactly how my car works before I can drive it: a no-brainer for some people, but it's not for everyone. Using Blender to draw objects from scratch is pretty daunting, especially if you are trying to create something highly complex. You start from scratch, and--unless you happen to be an Autodesk Maya expert--should expect that you are going to have to read the manual, follow the tutorials, and do lots of homework. Lots. But since Blender is entirely free, it's worth the effort if you are serious about 3D art and animation, whether amateur or pro, and have a lot of artistic talent and perseverance. Unlike any 2D art or 3D design software I'm familiar with (Adobe Creative Suite, CorelDRAW, Xara Designer Pro, Poser 9, etc. ), Blender seems to favor users who also are programmers or gamers, or at least engineering-inclined. One example of this is the way Blender incorporates keyboard shortcuts. Most designers are use to navigating through button or menu items to find the tool they need to use, using shortcuts for the things they do most often. Blender uses the keyboard for almost everything. For example, if you hit the Scale button with your mouse pointer, you will find it near impossible to scale your selected item with any precision. Use the shortcut S and you now have meticulous control. 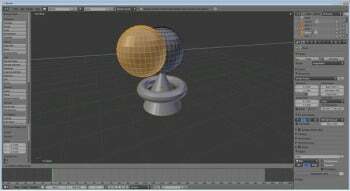 With Blender, you can model using a preset basic mesh object--cone, cube, cylinder, sphere, torus, etc.--that you can extrude and reshape. There are tricks to learn to perfect adding textures and patterns, and even changing colors seems unnecessarily difficult until you figure out how to do it. But there are online tutorials available, if you have the time and dedication. I did, however, really miss the searchable Help and tutorials that are included in 3DCrafter (also freeware), an equally daunting program that doesn't expect you to spend months on a beginner's tutorial. If you're a novice, and hope to have your 3D art or animation project completed (or at least started) in hours rather than months, in may be worth the pain in your wallet to start with $250 Poser 9. Unlike Blender, with Smith Micro's Poser you are purchasing both the program and more than 1.7 GB of malleable figures and shapes; plus with Poser it's much easier to progress from beginner to intermediate. And since you can import 3DStudio, COLLADA, BVH motion capture, scalable vector graphics, Stanford (.ply), STL, Wavefront, and x3D Extensible 3D files into Blender; and export all except scalable vector graphics, in addition to Autodesk FBX files, when you have your characters made, you can always import them back into Blender if the Poser animation isn't up to your standard. If you are a pro using $3,500 AutoDesk Maya, you may also want to take Blender for a spin. Although Maya is more comfortable for many artists, Blender's ease-of-use is catching up fast and both programs have their strengths and weaknesses. You never know--at your next job interview you may be asked if you know Blender; because if you have the skill and know-how, you can do everything in Blender that you can do in Maya and other high-end, high-price 3D modeling and animation programs. Blender is hard to get started and even harder to master, but once you have, you can render 3D in the same league as Maya and 3DStudio users. See you at the next Academy Awards ceremony. Note: This product is donationware. It is free to use, but the author accepts and encourages donations towards further development. Using Blender to draw objects from scratch is pretty daunting, especially if you are trying to create something highly complex, such as a face.